Weighted keys give a natural and realistic feel to digital pianos and keyboards. Keys which aren’t weighted feel very different to acoustic piano keys, the keys are either ‘on’ or ‘off’, as are the sounds. Weighted keys give you the chance to play more gently or harshly and the velocity of the sound will also usually be impacted by how hard you press the keys. 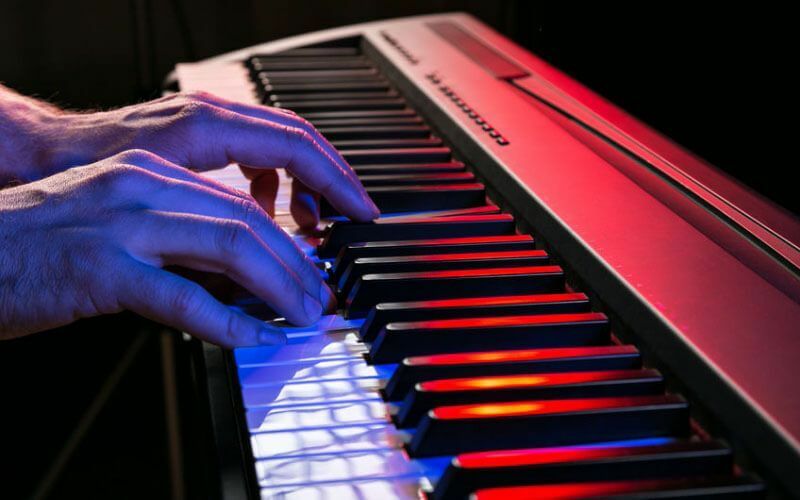 In this article, we’re looking into the best digital pianos and keyboards with weighted keys, with reviews of many of the top rated products for beginners and pros alike. What are the Best Digital Pianos With Weighted Keys? What are the Best Weighted Keyboards on the Market Right Now? There aren’t as many keyboards as there are digital pianos which have weighted keys. A digital piano is usually designed to be an alternative to an acoustic model, and therefore be realistic and true to the pianos which have been around for hundreds of years. Keyboards are a little more focused on providing a wide array of sounds, some of which are even synthesized. Keyboards are also more likely to have fewer keys than a full 88-key digital piano. 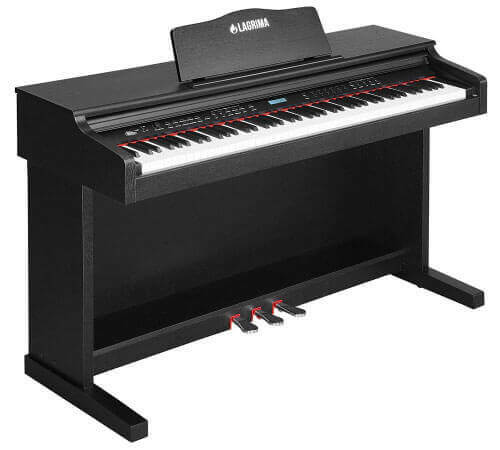 Yamaha digital pianos are always a popular choice for weighted keys and full-length options. The weighted action on the P-125 is one of its key selling points. The keys are not only weighted but weighted more heavily in the lower keys and lighter in the higher keys. This is to simulate the feel of an acoustic piano. The acoustic feel is further enhanced by the Pure CF Sound Engine which contains samples of a Yamaha grand piano which can be played at multiple velocities and is as close to a grand piano as you can get while staying digital. The digital features allow you to connect to music software and other musical equipment via MIDI cables or just audio cables. You can split the keyboard to play multiple sounds, of which there are 24 in total. You can plug in headphones and pedal units if you wish as the P-125 is compatible with these products. It has 14W of power which is fine for home practice, but for concerts and even band usage, you may want to plug it into further amplification. 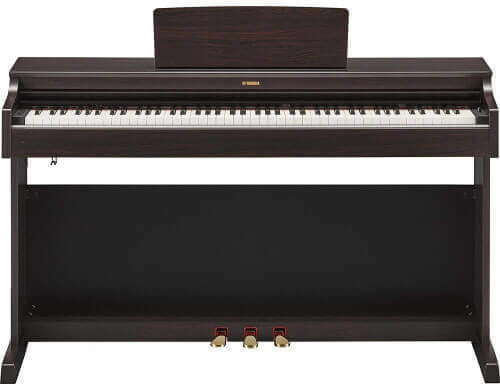 Another top weighted option from Yamaha showing just how wide a range of pianos they offer. The DGX-660 is a little more expensive than some of their other products, and it is also a hefty product so you probably don’t want to use it as a portable digital piano. However, if you are looking for something to become a permanent fixture in your home, this is a high tech and smart option. The Yamaha sound engine is used once again to replicate their concert piano. The weighted action is also heavier the lower down on the piano you go. The DGX-660 has some impressive functions such as allowing you to upload MIDI songs onto the screen and turning it into notation so you can follow and learn songs more easily. It also has a six-track recorder so you can layer multiple sounds and experiment with your own compositions. In terms of sound, this has something the brand calls a ‘Piano Room’ where you can choose different piano samples and acoustics based on your preference. Korg is a brand best known for their synthesizers. In the modern age, they make everything from guitar tuners to digital pianos as their range has grown. The B1 is a popular model of digital piano with weighted keys. The weighting of their keys is described as ‘natural hammer’ and is designed to be realistic, so you could think you were playing an acoustic model. Adding the joy of a piano to your home? Searching for an accurate and reliable instrument? Need a convenient keyboard for some serious practice? Compact and budget-friendly, the B1 by Korg is a top digital piano option under $500 and definitely the right choice for you. The design is relatively small and simple with not much of a control interface, so it is a good digital piano option for beginners, who don’t want to be bombarded with options. There are eight different sampled piano sounds which can be combined with inbuilt effects to create the ideal sound for your own preferences. 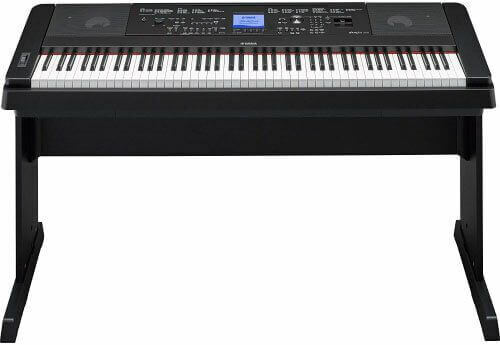 Casio is another brand which we often associate with both keyboards and digital pianos. Their Privia range has been very successful and the PK-160 is one of the best 88-key weighted digital piano options. With all the connectivity and technology that you could wish for. Casio have included a great range of 18 piano sounds and a ‘pure’ function to improve resonance and sound as good as possible. The hammer action weighted keys allow you to play more detailed melodies with more nuance, due to the multiple velocity sounds you can trigger by playing softer and harder. Effects such as reverb and chorus add to the sound further. These are inbuilt so you don’t have to plug in any other effects units. This is compatible with other PA systems or speakers via the line out, but 16W of total speaker power and decent clarity is perfect for practicing at home. Via USB you can also turn this into a MIDI controller for music software. Medeli is not a manufacturer with as much history as the other options on this list, but this is a good quality digital piano, and it is full-sized at 88 keys while still offering lots of features that you won’t find on other digital pianos. The SP4200 feels like something of a hybrid between a keyboard and a digital piano. It is perhaps more accurately described as being the best full-size weighted keyboard. While it has weighted keys and a hammer action which makes this feel like an acoustic piano when playing, the voices and tech features feel like a keyboard. An unbelievable 600 voices are included, which opens up a world of opportunities for playing new and interesting sounds. It also has 128 note polyphony, so sounds don’t get missed when you’re playing complex melodies. 230 style accompaniments round off a huge amount of choices. There is even a guitar mode which replicates the sound of chords and picking on acoustic guitars. You can record what you play easily onto a USB storage device via the USB host, another feature not offered on many digital pianos. This is an affordable product too, at a fraction of the price of some other models by bigger brands. The speakers and sounds aren’t quite as good as these brands, hence the price difference. As you can see, the amount of Yamaha models on the market is considerable. The brand is prolific and has different pianos at different price points. The Arius YDP-163 is among the more expensive products in their range, but it lives up to its cost. This model is focused on being close to a grand piano, and has nuance and detail in the ways you can play. The three-sensor design of the weighted keys senses how hard the keyboard is being pressed and then recreates the feel of an acoustic piano. It has pedals inbuilt, including a ‘half-damper’ pedal which gives subtle variations and adds more control to the player. Control is one of the key features of the Arius. Like many of the other Yamaha pianos, this has the ‘Pure CF’ sound system which samples audio in a high quality and accurate way to recreate the feel of an acoustic piano. Like some of the pianos with a more modern feel, this has a built-in record option so you can track your playing and listen back to it after. There are also a number of classical songs built in for playing along and learning. The ONE is something very different from the rest of the products. The term ‘smart piano’ is not one you are likely to have heard very often, but it lives up to the billing with some incredibly high tech functionality. 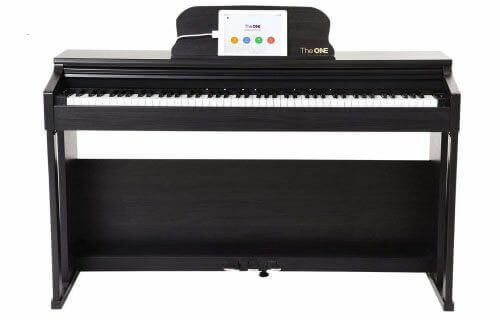 Reviews of The ONE are generally very favorable as it has been made to change the way people learn how to play, making this one of the best digital pianos for starters and those just beginning to play piano. The free apps which are included provide lessons, videos and free games that you can play to help build your skills. The app works on phone and tablet so whether you use iOS or Android you will have no problems with compatibility. The actual playing on the keyboard is guided by a system of lights to show the notes you should play. This piano is designed to be your tutor as well as your instrument. It isn’t a novelty product, and the ONE is a wonderful piano with a quality body, full set of pianos, a quality sound system with stereo speakers, and of course weighted keys with a hammer action. If you are a professional then a lot of the features may not be useful to you, but if you are looking for a good beginner digital piano to learn your trade, this could be the ONE (quite literally). Yet another musical powerhouse brand! Roland products are commonly seen on stages around the world. They make a lot of different keyboards and portable digital pianos, and this is one of their 88-key models which is great for the touring musician. The FP-30 gives a detailed and authentic tone. The ‘supernatural’ sound engine is multi-sampled for a lot of control over the tone and sensitivity of touch, coming from a hammer action which gives an authentic feel to the keys. Modern functions include the Bluetooth connectivity that means you can link this up with a number of apps for both learning to play the piano and recording your own compositions. It also has a pedal with a rubber plate to stop it from slipping, so you can even take the pedal on the road with you. It is often sold bundled, coming with the pedal, headphones, a bench and AUX cable. It also has a free bracket for holding an iPad or other tablet or phone for using an app while you play. Another option which is most suitable for taking on stage or out to band practices. Finding a product which is great sounding but also portable, and doesn’t lack features due to being lightweight can be difficult. The ES110 is one such product. The sound quality is good, and while it doesn’t quite rival all of the 80 or 90 lb models of piano, it does have plenty of clear piano tones for using on stage, 19 sounds in total, of which eight of them are modeled on pianos. Their sampling technique uses imaging sound technology for a detailed tonal response. The full 88 weighted keys are also not as detailed as some of the other models. The hammer action is good, but not quite as nuanced and reliable as some of the more expensive pianos. This is often sold bundled, with a damper pedal, music rest, stage stand and bench. This option even has an included set of headphones. If you want something that will be permanently in the same room of your home then there may be better options than the Kawai, but for portability, this is tough to beat. It also has a three year warranty for protection on your purchase. This is a budget digital piano option that we wanted to include and is arguably one of the best cheap digital pianos with weighted keys. Everyone is on their own unique budget when looking for a digital piano or keyboard, and not being able to spend a fortune doesn’t have to stop you from getting a good piano with weighted keys. The main sacrifice in terms of the cheaper price point is the clarity of the sounds. The piano tones don’t sound quite as professional as some of the Casio and Yamaha models to make our list, and the speaker system could be more powerful. That said, there is plenty to like for a piano on a budget. It has three built-in pedals, a display screen and an incredible 960 tones. It has functions you wouldn’t necessarily expect at this price such as recording and playback options, a teaching mode and a metronome. You can use the Lagrima LG-8830 as a controller for Midi and USB applications and playing virtual instruments or sequencing on your computer. You may well be in the market for a weighted keyboard rather than digital piano. There aren’t too many of these around, as a lot of keyboards do not have a weighted action, but there are some more compact weighted options out there. The Roland RD-64 is a more compact option, and is designed to be just 13kg and fit in the back seat of any car. Like the Roland digital pianos, it includes the SuperNATURAL piano engine, this gives it a wonderful depth of sound with added realism and other sounds besides piano. Organ and clavinet sounds are among the 12 tones. The accurate and responsive weighted keys are very unusual for a product this size. It also has some built-in effects such as reverb and EQ as well as the option to set it up with the INTEGRA-7 modular system to channel the sounds of Roland’s Jupiter 50 and 80 synths. This is incredibly simple to get started with, and the variety of sounds also makes it a great weighted keyboard for beginners or for those who are more experienced. If you have a high budget to spend on your keyboard, the Nord range can provide some very tempting options. The Nord Stage 3 HP76 is one of the best weighted keyboards on the market. There are no other products on our list which give such an incredible array of sounds. The Nord gives access to an editor allowing for sound design, and 2GB of sounds to start with. There are three different sound engines providing all of these options. The realistic feel comes from a weighted, hammer-style keyboard. The Nord also ships with a high quality stand perfect for setting up on stage and some KRK headphones for noise-free practicing. The Nord Stage 3 HP76 is the best 76-key weighted keyboard option if you have the financial backing! This is another stage keyboard which certainly isn’t cheap, but it has a lot to offer in terms of its weighted action and wide range of sounds. The SV-1 has a very simple design with no LCD screen, but plenty of options for presets and loads of sounds, as well as inbuilt effects such as reverb and chorus. The sound can also be further personalized as you can use amplification and cab modelling to recreate the sound of famous amps and add another dimension to your sound. The RH3 Key weighting has been described in reviews as ‘the best keyboard you’ll find on a stage piano’, so for a smaller keyboard, which is portable enough to carry out and about, the Korg SV-1 has a really classy and realistic feel. Weighted keys are all about resistance. They are heavier than non-weighted keys to play, and this is designed to recreate the action that grand and acoustic pianos have as part of their playing mechanism. It also means the harder you press, the louder the sampled piano is played, to give a realistic sound as well as feel. You will hear the terms ‘fully-weighted keyboard’ and ‘semi-weighted keyboard’ during your search. Semi-weighted options are spring-loaded just like the keys of synths and other non-weighted keyboards. They do have some resistance though, meaning it doesn’t rebound straight up to its natural position as quickly, and needs to be pressed a little more firmly to generate sound. This is more true to the feel of a piano than a flimsy or cheap, non-weighted keyboard, but isn’t as realistic as hammer action. Hammer action may sound like a blockbuster film genre, but it is, in fact, a musical term. The term comes from the way acoustic pianos often work, with mini hammers attached near the keys which provide resistance when actually pressing the keys. This is different to some other keyboards which instead use a spring to literally “spring” back up after playing each key. Do I Need a Full Size Keyboard or Digital Piano? One of the choices to make when you’re in the market for a digital piano or a keyboard is whether you need it to be full sized. If your piano is going to be stationary and kept in one place in your home then there is no real disadvantage to getting a full 88-key digital piano. If you need a portable option, though, sacrificing some keys might be the way to shed some weight. For most pop and rock songs, 61 or 76 keys will be enough, but if you are playing jazz, classical or other challenging styles, then you probably need all 88. As you can see from our list, the options available to you are numerous! No two digital pianos or keyboards are identical, and though all of these options have fully weighted keys and will provide a realistic feel, they all have different features. Doing a little research and considering whether you will need a portable or a stationary model, how many sounds and tones you want and even whether you are looking for a digital piano for a beginner or for a seasoned pro will all play a part in your decision. All of the models of digital piano and keyboard reviewed on our list can offer plenty to the aspiring pianist, working out which one is perfect for you is vital and can be assisted by reading our buying guide.